Added links to audio/video files of Sam performing. Installed a new guestbook. Please leave a message for Sam. Updated front page with Sam's current status and contact info. Added some more pictures of Sam and of his calligraphy. All pages are valid XHTML 1.0, and have been tested in IE6, IE5.5 & Mozilla 1 PC. Over 120 Songs and Stories on Two CDs Featuring Celtic, American, European Folk Melodies, Reels, Jigs, Double Jigs, Airs, Fiddle Tunes, Yiddish Melodies, Hymns, Hoedowns, and Hornpipes and more. After purchasing his first harmonica at the age of five, Sam Hinton was playing Turkey in the Straw before he was even out of the shop. Now, 80 years later, his childhood ambition to learn every song he heard is just one of the many accomplishments he has realized in his long life. 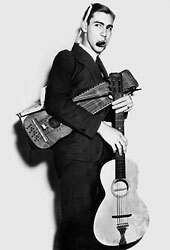 In 1937 Sam joined the Major Bowes Transcontinental Revue, and for decades since he has entertained audiences around the world with his music and good humor. One of Sam's other childhood (and life-long!) interests was the study of Natural History. After studying zoology at Texas A & M and at UCLA Sam served as Director of the Palm Springs Desert Museum, and then (for nearly 20 years) he was Director of the Aquarium-Museum at the Scripp's Institution of Oceanography. He has written three books on marine biology, produced more than 1,200 installments of a weekly newspaper feature called "The Ocean World", and countless illustrations. Throughout his career as a naturalist he has simultaneously worked as a part-time teacher of college-level courses in music, folklore, art, science and geography; as a calligrapher and artist; and as a performer of folksongs for audiences of both children and adults. As an educator he regularly taught University of California courses for more than 35 years, and spent 16 years as Director of Relations with Schools for the University of California, San Diego. In his 65-year professional career as a performer he has given thousands of concerts all over the US, Canada, Mexico and Europe. He has had his own radio and television programs, and has appeared at most of the major folk festivals. Sam has recorded a dozen solo albums (some 200 songs). 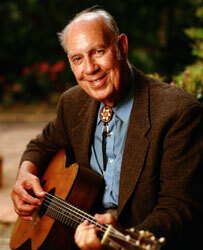 His 1947 recordings for the Library of Congress were issued on CD by Bear Family Records in 1999. His most recent project is the recording of his entire harmonica repertoire with the aid of his friend and adimirer George Winston. Sam lived with his wife Leslie in La Jolla, California for 56 years until her death in 2005. They have two children and two grandchildren. Sam died on 10 September 2009 at the age of 92. The Sam Hinton Website is a labor of love. Its purpose is to educate the public about Sam and his contributions to American folk music, oceanography and so much more. 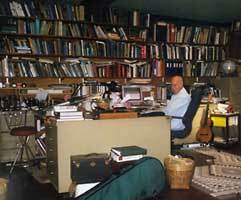 In August of 2001 I was standing in Sam's library admiring his collection of books. Sam and his wife are avid and eclectic readers, and in addition to the expected subjects such as music and oceanography he has tomes ranging across such diverse fields as stage magic, children's games, and one-up-manship. It occured to me that the riches contained in the many meters of those shelves were no match for the richness and life contained in the mind of the man who owned them. I'm a website designer, and it seemed wrong to me that Sam didn't have a site dedicated to him, so I decided to share Sam with the world. This site is the result. Here you will find everything I've been able to collect regarding Sam: information on his life, albums, books, illustrations, etc. I hope that you enjoy the site, and learn a bit about a man who has enriched so many lives.